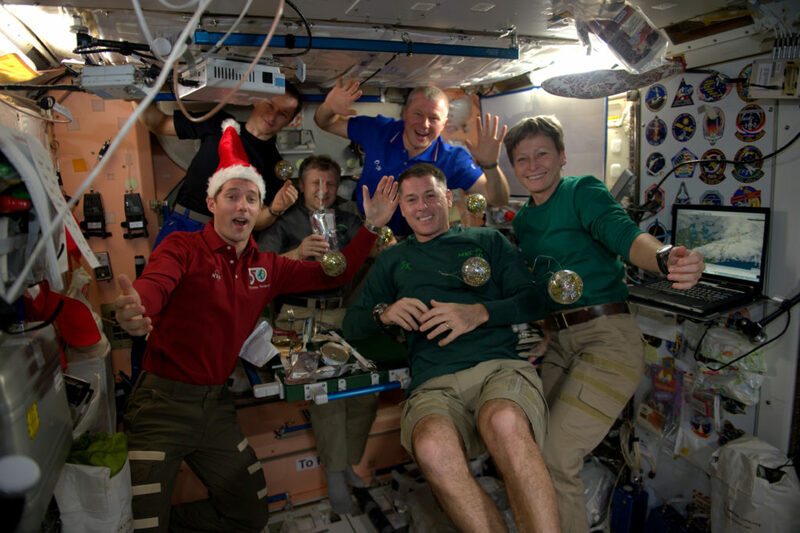 The Expedition 50 crew enjoys an international Christmas dinner aboard the space station. The Expedition 50 crew aboard the International Space Station spent the week working on an array of science, maintenance and spacewalking preparation to close out 2016. Kimbrough and Flight Engineers Peggy Whitson and Thomas Pesquet are getting ready for a pair of spacewalks on Jan. 6 and 13. The spacewalks, in conjunction with remote robotics work, will complete the replacement of old nickel-hydrogen batteries with new lithium-ion batteries on the station’s truss structure. The crew performed a loop scrub on their spacesuits, reviewed spacewalking procedures and did a fit verification with their suits on Friday. The crew participated in a variety of science experiments during the week including the Fluid Shifts study, which investigates the causes for lasting physical changes to astronauts’ eyes; performed the final harvest of the Outredgous Romaine Lettuce from the Veggie facility, which is further demonstrating the ability to grow fresh plants in space to supplement crew diets; and continued preparing the station’s Combustion Integrated Rack (CIR) for the upcoming Cool Flames Investigation, which will provide new insight into the phenomenon where some types of fuels initially burn very hot, then appear to go out — but they continue burning at a much lower temperature, with no visible flames (cool flames). Going into New Year’s weekend, the crew will enjoy their typical off-duty time on Saturday and Sunday. They also will have Monday, Jan. 2 off.